Reds left with lessons to learn at Leeds.. | Through the seasons before us..
Reds left with lessons to learn at Leeds.. So, it was nice being the last unbeaten Championship side for a few hours, but it didn’t last long. And despite Leeds being unsurprisingly Leeds-like, and D’Urso being unsurprisingly D’Urso-like, we never managed to offer enough in an improved second half to counterbalance a pretty shoddy first half in which the home side scored both their goals. Despite this largely being a first half to forget, Forest did start quite brightly with decent possession and pressure on the edge of the Leeds area. A Gillet shot was charged down, a nice pass from Coppinger gave Cox an opening but his effort was straight at Kenny who held on to the ball to deny Blackstock the opportunity of a rebound effort. Leeds started to awaken though, a Lees headers from a corner was just wide – but Forest were still at the races, more good work from Cox won us a corner from which the ball was put in the net by a combination of Collins and Peltier – the referee deemed this a foul though. Difficult to tell from our seats, and needless to say the replay board didn’t deign to show it. The home side took the lead shortly after – Diouf performed a bit of trickery to get space from Harding to put in a dangerous cross, the Reds struggled to clear and the ball fell kindly for Becchio – the last person you’d want it to fall to – who was able to powerfully strike the ball into the roof of the net from inside the area to give Leeds the lead. It’s fair to say this boosted the home side immeasurably and Forest seemed to wilt as Leeds’ confidence grew. The lead was doubled when Ayala made a mess of what should have been a fairly routine clearance, giving goalscorer Becchio the opportunity to shoot – Ayala recovered to get a tackle in but the ball fell kindly for the onrushing Poleon who finished well to double the lead. Forest attempted to haul themselves back into it – largely through some fairly crude direct football. A decent ball from Ayala found Cox who was summarily hacked down by Pearce, D’Urso booked him – the freekick seemed to take a while to take, eventually Reid put it off target. Coppinger put one just wide just before half time, and that was pretty much it aside from two more good opportunities for Leeds. So O’Driscoll had a job on at half time, because whilst there was an element of fortune to both Leeds goals, they were undoubtedly good value for the margin of their lead and we were not playing well at all. He made two changes, switching is back to a 4-1-3-2 formation by taking off Moussi and Reid and introducing McGugan and Lansbury. Early in the second half Coppinger had a decent chance to get us off the mark but was denied through the attentions of Adam Drury. A McGugan free-kick struck a defender first enabling Kenny to make the easy save – but Forest were definitely setting about their opponents more than they had for much of the first half. Another McGugan freekick after a cynical foul on Blackstock was struck into the wall. The goal came from the ultimate direct source, which probably seems apt since we’d struggled to play much decent football this afternoon. A long throw from Halford into the box found Blackstock who got to the ball ahead of Kenny to head into the goal – amazingly the referee could find no reason to disallow it so it was game on with an hour on the clock. Leeds’ main tactic to deal with a resurgent Forest was to make a couple of substitutions lasting approximately three weeks each, and to have their players go through cycles of feigning injury whilst waiting for the trainer to come on. The referee was spineless, and fell for every single trick – which was frustrating. I used to hate it when we did that kind of thing under Billy Davies, but I suppose you expect it at Elland Road. Coppinger had another effort, this time cleared off the line – although it wasn’t all going our way, a header from Austin (probably the most influential home player, I thought, as the second half progressed) was saved well by Camp. Cox created a good chance for Dex, whose effort was blocked, the ball came to McGugan who struck a good shot goalward which was stopped well by Kenny with a diving save. Lewis McGugan struck a decent freekick just wide, and Forest continued to try to press. Lewis was having a bit of an impact, a nice turn in midfield was rudely halted by Lees – the resulting freekick was struck powerfully into the area and appeared to strike a hand in the box, which was – naturally – ignored by the referee. Halford had an effort from close range blocked, as Forest continued to be frustrated in their efforts. Sharp was introduced late on, replacing Coppinger for the last seven minutes or so – but Forest were struggling to keep up their momentum in the midst of both our own lack of ideas on occasion but also the frequent stoppages in the game through fouls or mysterious injuries to Leeds players. 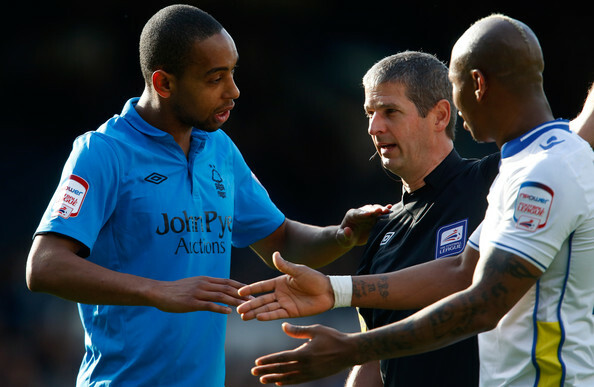 Six minutes of injury time were announced, but Forest had started to run out of steam. We certainly had opportunities to snag an equaliser, and whilst our second half performance was much improved, it wasn’t enough to counter the poor first half – so I’m consigning this one to a learning exercise for the manager. It’s demonstrated that Moussi and Gillett together doesn’t really work very well – and on the brighter side I liked the look of what I saw from Lansbury, it will be exciting to see more of him in a Forest shirt. We have a little over a week now for one of our most important fixtures of the season – there will be no better occasion for the Reds to bounce back with a positive result. The goals are here if you’d like to see them, and you might have spotted a familiar name in the Leeds United programme if you decided to cross Ken Bates’ palm with four quid. What is it with D’Urso & Forest fixtures?? We always seem to get the short straw! Seems like we need to concede a goal or two to snap into action lately. Have to agree nffc with your opinion on Ayala’s clearing effort for Leeds’ second goal. He was on the right side to clear but somehow ended up on his backside & kept the ball alive for Leeds….. Pretty woeful! Can’t say he has impressed me thus far. The fixture says Forest will have 3 games in 6 days starting with Derby. I’m not sure that’s a good thing with the way we’re playing at the moment. Would love to know why McGugan started on the pine. He’s in good form isn’t he? Bamboozling game on many fronts….. Disappointing to lose our unbeaten tag especially to our West Yorks “friends” but I guess it was always going to happen at some point. Maybe good to have a reality check before next Sunday so we can refocus and move forward. I’m rather worried that Leeds had so much dominance for the last 30 mins of the first half. Yes, they had their tails up after the goals but had they taken their chances, they could have been out of sight. This apparent lack of concentration seems to be happening all too often in games. But I love the way O’Driscoll has no hesitation in changing things round in order to shake things up. A word about Leeds….. as I’ve tweeted, I don’t think I could bring myself to support them if they were the only football team on the planet. Maybe its just Warnock, but their approach to the game is so annoying, what with time wasting and feigning injury,. I’d go so far as to say that if Forest EVER considered employing him as a manager, I wouldn’t support them any more. I really do dislike him and his tactics that much…. What is it about Leeds. Warnocl proud of players feigning injury, playing to the corners for a full 30 mins, crowd cheering when their players foul people, and proudly singing “dirty Leeds”. Even the ball boys were stroppy little toads not passig the ball when players asked for it and trying to bounce the ball past camp. To sum Leeds up. I was speaking to the Stewards before the game. Asked them why they had moved the away fans. He said because they wanted them away from the corporate boxes. Did not want them having to put up with alway fans v home fans chanting ect. I said oh right thanks and went for a beer. Could not believe it when I got to my seat before the game and noticed the disabled section in between home and away fans ! This section had women and children in there. So Leeds move away fans because of the corporates but are happy to stick disabled people and their families between opposing fans… Horrible club, manager, ground, fans and football style. Your fans were nowt special. Well, ‘special’ in one sense, but you know what I mean. Well done on the win, though. Why has Lewis already been dropped? Does S OD have a deathwish? Gillett and Moose together in same team? Madness. some very bitter forrest fans on here,need to chill out a bit…..any team wastes time trying to hold on to a victory-hull city did the same thing to us at elland road last tuesday and it is very frustrating,but its part of football. All leeds fans did was copy our songs! we sang dirty leeds and you just sang it back, wow! and we started singing about brian clough and you did about don revie. Dont call our support when yours was hardly great. A trip to Leeds is always going to polarise opinion and yesterday was no different. Our starting formation and team just wasn’t in the game and the initial pairing of Gillett and Moussi across a ‘flat’ midfield just didn’t work. To be honest, I think Leeds wanted it more – they were stronger in challenges, didn’t duck out of any and were quicker to the 2nd ball. Our defensive 4 also looked out of sorts – there didn’t appear to be any communication across or between the back line and Collins seemed to spend a lot of time berating other players. The other big difference was Diouf – as I tweeted yesterday, I don’t like him, but his influence on the game was very strong and he seemed to relish a) in his ‘free’ central role and b) in playing to the crowd. Our substitutions at half-time were brave and very necessary and I think Lansbury will become a huge signing for us – With Gillett at the back of a diamond, protecting the back four, I would probably select Lansbury, McGugan and Guedioura when all are fit and available but that then leaves no place for Cohen, Reid, Majweski, etc … – WHAT a difference a year makes!! Disappointing to lose, but it has probably been coming from the last few games and at least gets that monkey off our backs before Derby next Sunday. No doubt that will be an equally strong and tense affair, requiring a referee who at worst, is consistent. A combination of last season’s result, their potential new investors being schmoozed by the hairy cornflake plus the midweek defeat by ‘ull were always going to make this a tricky one. Aside from our next opponents, there are few teams that I dislike losing to more than Leeds, especially when I had to endure the local radio commentary and the moronic dronings of Eddie Gray – who was only marginally more negative about Forest than the opposition. The fact that we went missing for two-thirds of the 1st half is a concern, but perhaps serves as a timely reminder that we should not get too carried away by performances in some of the earlier fixtures. The self-assured and organised defence from the first couple of home games now seems a distant memory and for me, some real questions remain as to whether some of the additions in this area will prove to be up to the task – particularly whilst we are failing to convert or create as many chances as we could at the other end. If not addressed next Sunday, we could be in for a nervy afternoon. Was Coppinger any cop, people? It had to be them eh I was gutted we bottled it in the first Half we were crap and they got stuck in . With the talent we have on offer we should be giving them the run around Moussi was lost and our left back looks suspect to me the defence needs to tighten up big time . So onto the sheep a few changes I would imagine but we need to start brightly and score first get them on the back foot. As regards who is worse out of Halford and Harding, at least Halford can turn Forest into the ‘New Stoke’ with his Delap-style hurls!!! Let’s not forget we are still WIP (down Billy) and there were some good chances in the second half that could have turned the table. Leeds were better on the day but there’s more days to come and we’ll be ready on Boxing day. As for worst fans, I think the majority of Leeds fans live outside of Leeds judging from the amount on our train back to Newark…a bit ManU, Chelsea etc. Bring on the Mutton Molestors on Sunday! So who were the Leeds players who were “feigning injury”? Do you mean Lee Peltier, who went down twice? He had to be substituted and will miss tonights League Cup tie with Everton, so there’s an outside chance that his injury might have been genuine. Hey, all you Leeds’s fans on our message board; why do most neutral fans dislike Leeds? A team that has been despised for nigh on forty years. ‘Cos, your dirty cheating thugs. Started with that well known cheat, Revie, and not much has changed. Think about it. Furthermore, I do hope your take over goes through – by a bank, no less. You can all start ‘living the dream ‘again, Ha! Not sure if your moniker should be Dirty Leeds, or Comedy Leeds. JJ in how many midfielders do we need? Discuss. I know? Maybe its just cover for AG as he will be missing some games through suspension? IF SOD is wanting to have 2 players for every position in midfield then surely a right winger would be a better loan move. A natural right sided midfielder is our biggest need. Is Jenas going to play there? He’s got a massive point to prove though and I’m hoping he’s got fire in his belly to do just that. He believes he’s premier league and for the last 2 years because of injury everyone has forgotten about him or deemed just too expensive. I’m sure SOD believes he’ll improve the midfield and it maybe McGugan can learn a bit from him. His career could quite easily follow the same peaks and troughs Jenas’s has.